Sunflower patch treated with Plantskydd Deer Repellent to keep whitetail deer from destroying it! 5-18-13: Planted approx. 1/4 Acre Perdovic, black oil sunflowers. They emerged 5-24-13, and were 3″ tall on 6-7-13. 6-7-13: Sprayed tops of sunflowers with 4 gallons Plantskydd solution (8 oz. Plantskydd powder concentrate per 4 gallons water) using Solo 4 gallon backpack sprayer. Deer had already browsed off just a few of the tops prior to this application. 6-18-13: Sprayed 4 gallons at same mixture as the application 6-7-13. A bit of deer browse was noted. 6-26-13: Plants are now 18″ tall, with tops almost doubling in size; so sprayed 8 gallons of same mixture due to a bit of deer browsing noted yesterday. 7-5-13: Sprayed 15 gallons at 16 oz. Plantskydd concentrate per 4 gallons water. Plants are now 30″ tall with tops tripled in size. Also wanted to see if doubling the mixture concentration would help reduce frequency of application. 7-18-13: Yellow seed head heads are appearing. Little to no deer browsing noted! This perhaps due to increased concentration at last application. 9-9-13: Began hand-harvesting most of the 8″ to 12″ diameter seed-heads. Deer had eaten a portion of a few seed-heads at this time; but not enough to warrant additional spraying. 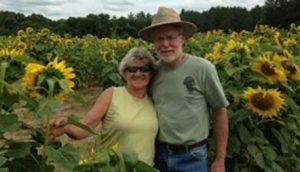 Summary: Because we had planted small areas of sunflowers in the past that had completely been eaten off by the time plants were 6″ to 12″ tall, we firmly believe the application of Plantskydd gave us a decent sunflower harvest for wintertime bird feeding! The Plantskydd spray mixtures were always uniform and presented no plugging issues. Comments about Plantskydd use. Mixing the Plantskydd powder concentrate with water was done in accordance with the recommendations noted on the package. Additionally, we rinsed the backpack sprayer with 1 to 2 gallons clean water at the end of each day, and also removed and cleaned the spray nozzle. This procedure helped prevent any material residue buildup in the sprayer, wand, and nozzle. to keep whitetail deer from destroying it!